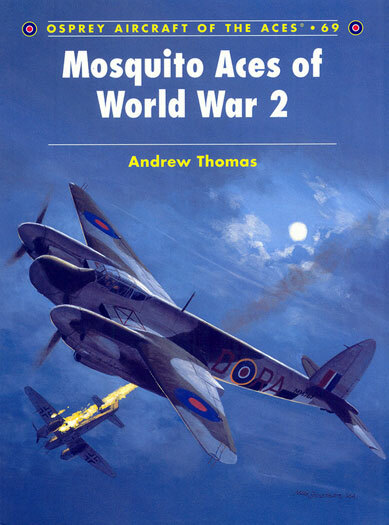 Mosquito Aces of World War 2 is a recent release from Osprey Publishing and is number 69 in their Aircraft of the Aces series. If a modern day aircraft term was applied to the De Havilland DH-98 Mosquito surely it would be Multi Role Combat Aircraft. Originally envisaged as a bomber, it found fame in a wide variety of roles that including high and low-level and attack, day and night bomber, long-range photo-reconnaissance, mine layer, pathfinder, high-speed military transport, long-range day and night fighter, fighter-bomber, and more ignominiously in her later life, target tug. This new book from Osprey covers a fair swag of the operational history of the Mosquito and relates the stories of the men who became "Aces" in the type by shooting down more than five enemy aircraft. The coverage is comprehensive commencing with its night-fighter role defending the skies over England in early 1942 and ending in the Northern Hemisphere's spring of 1945 when they ruled the night skies over Germany. As with all of the Osprey Aces series, there are ten pages of colour profiles with thirty profiles produced by Chris Davey. The profiles show just three schemes, the 'Intruder Scheme" of overall medium sea grey with dark green disruptive pattern to the upper surfaces, modified 'Intruder Scheme' of medium sea grey and dark green upper surfaces with black under surfaces, the early night fighter scheme of overall "night", and finally, the overall silver scheme with SEAC roundels worn in the Far-East theatre. I found the book to be well illustrated. Whilst the illustrations are all black and white they are of both men and machines and I have not seen most of them before. There are 75 photos in all. Mosquito Aces. By name, Service, Squadron, claims (s), total, and Theatre claimed in. Aces with Some Mosquito Claims. In the same format as the first Appendix. V1 Aces with Mosquito claims. In the same format as the first Appendix. Aces that flew Mosquitos but did not claim Kills whilst flying it. In the same format as the first Appendix. Colour plates. – Captions and commentaries for each of the colour profiles. The book itself has 96 pages printed on glossy paper between thin cardboard covers and is the same size as the Aircraft of the Aces series also produced by Osprey. This is a nice book. 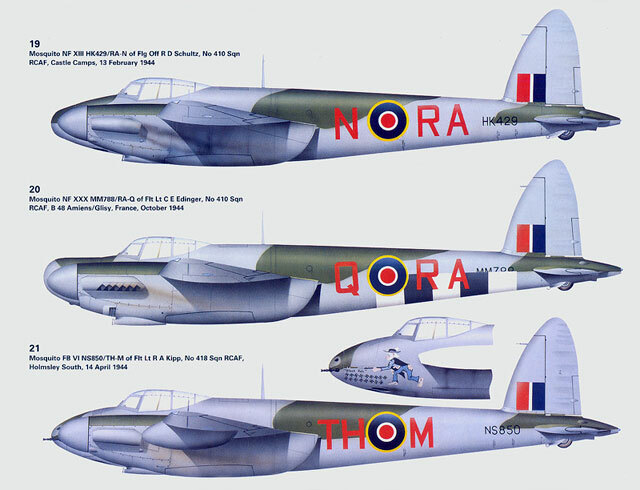 If you are looking for close-up reference pics to assist you in detailing your small scale replica of the Mosquito then look elsewhere. If you are however looking to gain an understanding of the role of the Mosquito in WWII, and the stories of the men who flew it then this is the book for you.